Noodle Bowl Restaurant is not a huge restaurant, but it still has been able to make its mark among the competitors because of its delectable Chinese cuisine and bustling locality, which brings a lot of customers to this venue. These customers relish Cantonese and other Chinese dishes like noodles with chicken, squid, shrimp, and tofu in the stylish and gracefully designed interior of Noodle Bowl Restaurant. In addition to this, guests will also find pork, prawns, seafood, poultry and meat items in the menu, which can either be consumed inside the restaurant or being taken away. - Dine-in option for breakfast, lunch and dinner. 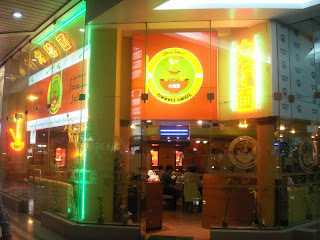 - People of Dubai can savour regional food of China at this eating place. - This is one of those Chinese restaurants in Dubai that also serves pork. - The menu also includes drinks which guests can enjoy with food. - In addition to this, guests can end the amazing experience of having food at this venue with some dessert. - Take away service is also available. Noodle Bowl Restaurant opens on all seven days of the each week and its operational hours are from 8:00 am till midnight. Al Diyafah Street, Al Satwa, Dubai, United Arab Emirates. World Trade Centre Metro Station 2 is about 18 minutes walking journey from the Noodle Bowl Restaurant, as the gap between these two sites is no more than 1.4 kilometres. Head north after coming out of this metro station and then turn slightly left towards 308th Road. Afterwards, turn left towards 308th Road before making a right turn onto 308th Road from where the patron needs to make a sharp left turn towards Al Diyafah Street/D 73 and then continue straight onto Al Diyafah Street/D 73. Finally, th patron will make a slight left turn, from where destination is not too far. Directions from World Trade Centre Metro Station 2 to Noodle Bowl Restaurant. Satwa, Roundabout 2 – Dubai bus stop is 140 metres away from Noodle Bowl Restaurant. This makes it 2 minutes walking journey if a person heads northwest on Al Diyafah Street/D 73 from this bus station and then takes a sharp left turn in order to reach the destination. Bus numbers 32C, 55, 88, 98E, C15, C26, F11 and X28 have stops at this bus station. 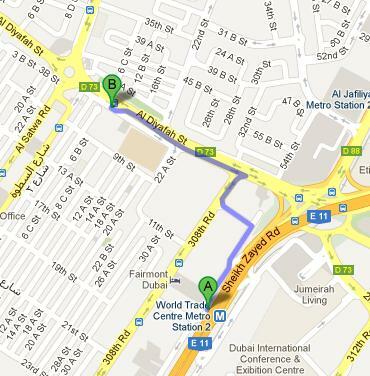 Directions from Satwa, Roundabout 2 – Dubai to Noodle Bowl Restaurant.